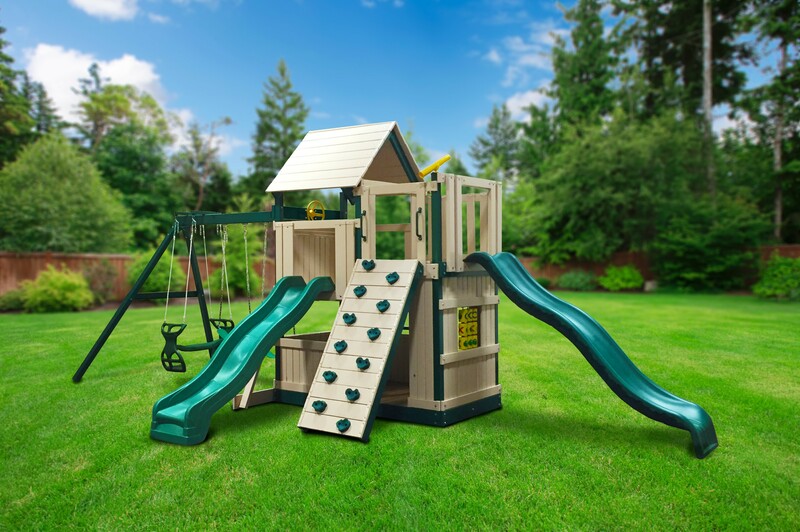 This outdoor playset offers a variety of features to keep kids active and having fun, from the Wonder Wave slide to the rock climbing wall. Kid-friendly chains protect little fingers on the belt swing and 2-person glider. Constructed of Woodguard-coated lumber, this playset doesn't require staining, sanding or refinishing. This play set meets or exceeds standards, using heavy duty materials from the swing hangers to the lumber. Not only is the Congo Playsystem a high-quality and long lasting product, but it is also eco-friendly! The lumber is treated with borates (an eco-friendly treatment process) and the polymer coating includes recycled plastics. The encapsulated lumber is premium treated Western Timber. The Congo Playsystems are packaged and ready to assemble.